6 of the 24 ounce Sweet Zesty Bread & Butter Pickles are our similar to our Bread & Butter Cucumber Slices, but cut into chunks and flavored with banana peppers to give it a mild zing! Salt, Spices, turmeric and Polysorbate 80. From Patricia of Lebanon, Illinois on 7/19/2015 . 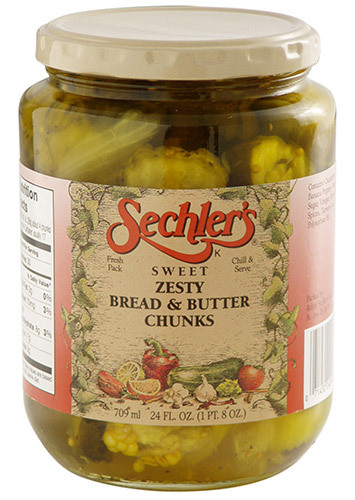 These Bread & Butter Chunks are amazingly crisp and just the right combination of sweetness and spice. They are far better than anything you find in grocery stores. From Anonymous of Fairfax, Virginia on 6/5/2015 . Have ordered several times. Good flavor and very crisp. Nice folks also - good customer service. From Anonymous of Fort Worth, Texas on 9/15/2014 .